This nursing home wrongful death lawsuit was filed after a man aspirated a portion of his food while residing at the Genesis facility, leading to aspiration pneumonia. This suit was filed in Health Claims Arbitration on April 19, 2017 and it is the 187th medical malpractice lawsuit filed in 2017 in Maryland. A man goes to Bradford Oaks after having a leg fracture repaired at Prince George's Hospital. Upon his admission, he has a "fair prognosis." He is also dependent on staff for feeding due to Parkinson's disease. Two days after his admission to the Genesis facility, the man is served a meal that is not properly prepared for him. He is also not provided with the feeding assistance his care plan requires. He aspires a portion of the meal into his lungs, and the staff fails to realize it. It is not until two days later that they do realize. He is taken to Southern Maryland Hospital where he requires emergency intubation. The man is diagnosed with aspiration, a fast heart rate, sepsis, collapsed lung, cardiopulmonary arrest, acute kidney injury, and deep vein thrombosis. After thirteen days at Southern Maryland Hospital, the man is transferred to Georgetown University and eventually to Brinton Woods. After five days in the rehab facility is taken to Johns Hopkins Bayview and then to Good Samaritan Hospital, where he is diagnosed with acute on chronic respiratory failure secondary to aspiration pneumonia. The man died a few months later from consequences and sequelae of the chronic respiratory failure caused by the Genesis facility. His Estate files this claim on his behalf, alleging that as a direct result of the injuries sustained while at Bradford Oaks, the man died. The lawsuit alleges that this Genesis nursing home and its staff knew or should have known that this resident was at high risk for aspiration because of his Parkinson's disease and other conditions. The lawsuit also contends that Genesis failed to properly access and recognize and provide appropriate treatment for his aspiration. Aspiration pneumonitis occurs when stomach contents are inhaled into the lungs, causing an infection. 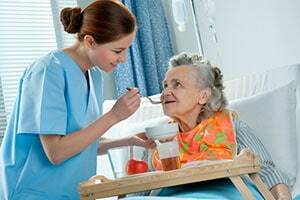 Residents with neurologic disorders can have problems coordinating their swallowing mechanism. The result is what we call food "going down the wrong way" on occasion. This happens to all of us. The difference is that our normal cough mechanism prevents pneumonia from occurring. The nursing home will argue that they did not know he had aspiration pneumonia. This diagnosis is one of exclusion. Unless a definitive blood culture or invasive bronchial culture was performed, a diagnosis of aspiration pneumonia can only be suspected. Every case of pneumonia is technically aspiration pneumonia. If you get pneumonia, it is because bacteria got into your lungs by aspiration. We are using the term aspiration pneumonia in this context as a bacterial infection that results from having food or liquids that go down into the lungs the wrong way. Parkinson's disease is often a red flag to the nursing home and its staff a resident is at high risk for aspiration, requiring close supervision while eating.